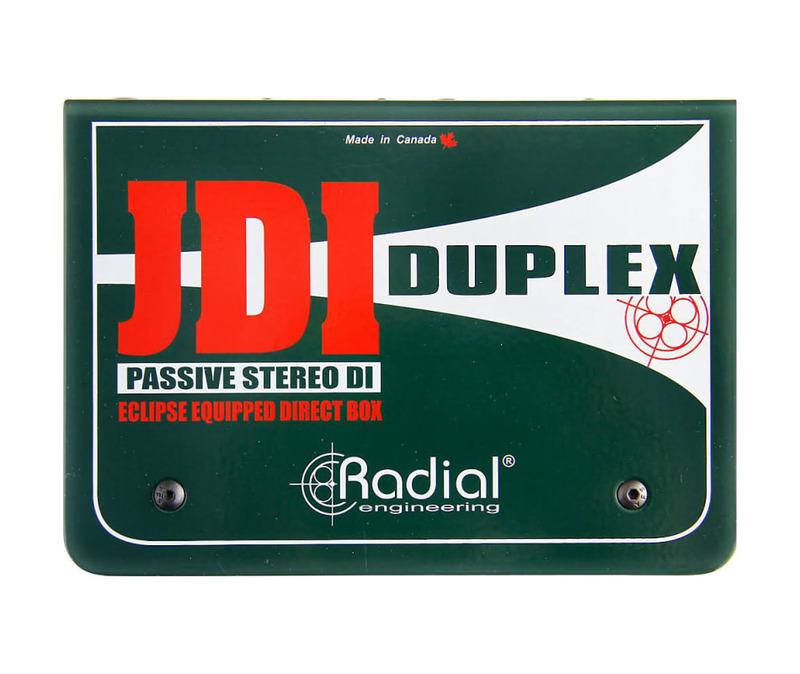 The Radial JDI Duplex is a full-feature, stereo passive direct box designed to enhance connectivity, reduce noise, and simplify the hectic life of the touring professional, broadcast engineer or AV integrator. It is plug-and-play easy to use while delivering the utmost sonic quality. Like the Radial JDI, the Duplex employs two high-performance Jensen audio transformers with the same pristine audio signal path that has made the JDI the industry standard. It features exceptional signal handling with virtually zero phase shift or harmonic distortion, while remaining linear across the entire audio spectrum. When driven to extremes, the natural transformer saturation and resulting warm Bessel curve makes the Radial Duplex the perfect choice for smoothing out highly dynamic instruments such as digital pianos and electronic drums that can sound harsh when pushed. Transformer isolation provides the additional benefit of eliminating troublesome ground loops that can cause hum and buzz in the audio system or interfere with video displays. This 'Swiss Army knife' DI is equipped with ' connectors for instruments, RCA connectors and a 3.5mm TRS for unbalanced -10dB consumer electronics plus XLR inputs for +4dB professional line sources. Radial's innovative book-end design provides protective zones on the front and rear to keep connectors and switches out of harm's way. The 14 gauge I-beam inner frame adds tremendous rigidity to eliminate outside stresses that could torque the PC board and cause premature solder joint and trace failure. The steel outer shell couples with the transformer's MuMETAL shield to protect against stray magnetic fields from power transformers or lighting systems that could cause interference. Finally, a full-bottom no-slip pad works double-duty by providing both mechanical and electrical isolation. The Radial Duplex delivers outstanding connectivity, superlative audio and quiet dependable performance..
JDI Duplex the world's finest passive stereo direct box.